My best asparagus recipes include many cooking methods such as grilling asparagus, roasting asparagus, steaming asparagus - offering storing and buying tips too. 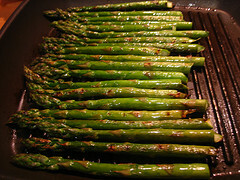 Asparagus is also included in many wonderful side dishes and savory casserole recipes too. You will find my Balsamic Butter Sauce and Steamed Lemon Butter Asparagus at the end of the page. Marinated asparagus is out of this world and the recipe follows. You may also roast the asparagus in the oven. Preheat to 400 degrees and roast for 10-15 minutes. This is an excellent asparagus recipe. Combine the olive oil, garlic and balsamic vinegar in a bowl and season with salt and pepper. Marinate for 2 hours before grilling. Heat your grill on medium. Meanwhile, soak some wooden skewers in water and thread the asparagus end to end - using one skewer on one end and another on the bottom end. They won't fall into the grill when cooking. Grill for approximately 4-6 minutes or until desired tenderness. Grilling asparagus is so simple, isn't it. When selecting fresh asparagus - look for firm, straight, rounded stalks with small and crisp tips. Avoid woody stalks. The girth of the stalk is not important; both thin and thick stalks can be tender. Fresh asparagus should not have a strong odor. Choose stalks that are uniform in size to ensure uniform cooking. Asparagus is available in green, white and purple varieties; white is less sweet. Asparagus is a spring vegetable with a short seasonal peak, usually best in late April through July. When storing asparagus - it's simple...eat as soon as possible. Keep it in the refrigerator for 3-4 days maximum. Are you freezing asparagus? It is simple. The best asparagus for freezing is the freshest asparagus spears you can find. Bring a pot of water to a boil, and cut off the tough ends on the bottom of the spear. Drop the asparagus in the boiling water for 3 minutes and immediately plunge in ice water. Blanch one pound at a time. Place in freezer bags, or better yet - use your food saver. Trim the woody ends of asparagus stalks before cooking. Very thick or tough stalks can be peeled, though peeling is not necessary (some cooks peel them for aesthetic effect). Asparagus can be boiled, steamed, grilled or roasted. Lightly steamed asparagus is wonderful with just a bit of high quality olive oil and fresh lemon juice. Are many health benefits of asparagus? Yes! This vegetable is low in Saturated Fat, and very low in Cholesterol and Sodium. It is also a good source of Pantothenic Acid, Calcium, Magnesium, Zinc and Selenium, and a very good source of Dietary Fiber, Protein, Vitamin A, Vitamin C, Vitamin E (Alpha Tocopherol), Vitamin K, Thiamin, Riboflavin, Niacin, Vitamin B6, Folate, Iron, Phosphorus, Potassium, Copper and Manganese. These nutrition facts about asparagus - courtesy of nutritiondata.com. How many calories in asparagus? One cup of asparagus has 27 calories. If you are looking for the best way to cook asparagus, I cannot help you. I love them all. I also have awesome grilled asparagus recipes and recipes for shrimp and asparagus for you to try right away. Now as promised, here's my asparagus recipes. Here's a Grilling Tip for Asparagus: Soak some wooden skewers in water and then skewer together 6 or 7 stalks of asparagus all in a row like a little fence, using two skewers, one at the top one at the bottom. They won't fall through the grate on the grill and they are easy to flip. PREHEAT oven to 450 degrees and line a baking pan with waxed paper. Place asparagus spears on the waxed paper and spray ends with vegetable oil. Season with pepper. Wrap a piece of bacon around each spear and secure the ends with a toothpick. Roast for 15-20 minutes or until asparagus is tender. Broil for 3 minutes so bacon is crispy and serve. This asparagus recipe produces an elegant way to serve asparagus, and your guests won't know it's so simple to make. PREHEAT oven to 450 degrees, and you will need a medium cookie sheet sprayed with vegetable oil. *You may also use deli sliced black forest ham. Blanch the asparagus in boiling water for 2 minutes and plunge in a ice water bath and drain. Wrap 2 to 3 stalks with the prosciutto and arrange in a single layer on the cookie sheet - spray with vegetable oil before putting them in the oven. Roast for 10-13 minutes or until asparagus is tender. Serve immediately or chilled, both ways are delicious. Melt the butter in a skillet over medium-high heat and then stir in the olive oil. Add the asparagus spears and cook for ten minutes (or until tender). When they are almost done add the garlic and stir for 2-3 minutes and finally season with salt and lemon pepper to taste before serving. You may sprinkle this with parmesan cheese and add sauteed mushrooms if you wish. Another simple and delicious fresh asparagus recipe. This is a light and tasty fresh asparagus recipe that you bake in the oven. PREHEAT the oven to 375 degrees, and you will need a baking dish for this recipe. Break off the tough ends of the asparagus spears and place in the baking dish. Drizzle with the olive oil and fresh lemon juice. Season with kosher salt and pepper to taste and sprinkle on your sesame seeds. Bake for 11-13 minutes or until fork tender. You may serve this with lemon wedges if you like. Do you want to learn how to roast asparagus? This is my favorite way to eat asparagus. 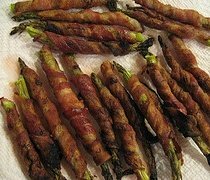 Following is a asparagus recipe that I love. So easy to prepare and what a treat. PREHEAT oven to 425 degrees and wrap foil around a cookie sheet. Cut off the woody bottom of the stalks and discard. Peel approximately 2-3" off the bottom of the stalk so it doesn't become stringy. Put the olive oil in a resealable bag and add the asparagus. Shake until all the spears are equally coated and put on the foil lined cookie sheet. Sprinkle with kosher salt and roast for 10-15 or until they are as tender you want them. The tips will be very brown. You may sprinkle parmesan cheese over them or add soy sauce and sesame seeds when roasting. They are also delicious just the way they are. This is a wonderful asparagus recipe if I say so myself. In a large skillet, bring approximately 1/2 inch of water to a rapid bowl and add the kosher salt. Add the asparagus and steam for 3 minutes or until bright green in color and just getting fork tender. Drain and immediately immerse in ice cold water and drain again. In the skillet melt the butter and add the lemon zest and juice. Return the asparagus to the skillet and toss lightly to coat for 1 minutes or so. Serve. Sauce recipes sometimes get a bad rap for the fat content - not this one. If you are in need of a fast and simple sauce for asparagus that is grilled, baked, steamed or roasted - this is the one for you. This is also delicious over grilled steak or fish and freshly roasted green beans (the sky is the limit). Browning the butter is crucial, and you'll agree after you taste it. In a small saucepan, add the butter and melt on medium high heat until it is browned in color (very important to the overall taste of this sauce). Add the vinegar and reduce the sauce a bit. Then add the soy sauce; season with salt and pepper to taste. Heat through and pour over the asparagus. Don't have a grill - or it's raining outside? PREHEAT oven to 400 degrees and grease a baking sheet. Then roast the asparagus. Coat asparagus spears with olive oil and balsamic vinegar. Place in a single layer on the baking sheet and season with kosher salt and freshly ground black pepper. Roast for 10-15 minutes.